We've got a while to wait until the next new MCU movie hits cinemas, but that doesn't mean we're not still mad about all things Marvel. While we wait for Captain Marvel to arrive, let's see if we can work out what the best Marvel movie released so far is. I know it sounds easy, but, actually, when so many films in a franchise are this good, it's pretty difficult picking just one for the top slot. While I think we can all agree which films should rank at the bottom of this list (*cough* Thor: The Dark World *cough*), picking the best Marvel movie ever is a lot harder. Avengers: Infinity War is the biggest... but Black Panther did something different. Everyone loves Guardians of the Galaxy, but should Iron Man get more credit for being the first? And how do you even compare Spider-Man: Homecoming and Captain America: The Winter Soldier? They're such different movies, but both really, really good in their own way. After a long, long debate, the GR team (sort of) agreed on the below ranking - from worst to best - for every MCU movie released so far, but be warned, it's doubtful you'll agree with it completely. Instead, read on to find out our ranking (or just skip straight to page 3 to see what we think is the best Marvel movie), and then let us know in the comments section below what's your favourite MCU film. If we're being honest, a cape-wearing, long-haired god who talks like Shakespeare was always going to be a bit of a hard sell for modern-day cinema goers. While Thor: Ragnarok knows how to have fun with the ridiculousness that is the God of Thunder, Thor: The Dark World, much like its predecessor, suffers from just being a bit too superhero-y. In a cinematic universe where we have intergalactic space opera shenanigans, WW2-era war films, and size-altering heist movies, a handsome man in a cape fighting a villain who comes across as Generic Evil Guy doesn't stand much chance. Then there's the painfully unbelievable romance - Natalie Portman really didn't want to be there after only signing on to with work with Wonder Woman director Patty Jenkins who promptly dropped out due to "creative differences" - and let's not forget that vague Aether stuff, which actually turned out to be pretty important, but at the time was just weird and confusing. Sadly, someone has to be lowest on this list and I think most would agree it's The Dark World. Of all the movies of this list, Captain America: The First Avenger probably split the GR team the most. Some see it as the beginning of everything we love about the heroic Cap - the bedrock on which one of the MCU's major characters is built - while others just remember, well... how dull the storyline is. While Chris Evans is superb as the young skinny kid from Brooklyn who becomes a beefcake overnight and fights the Nazis, having a villain named the Red Skull removes any opportunity to tell a particularly nuanced story, and it takes far too long to get to the action. If I never see another scene of Cap on his promo tour, it'll be too soon! Of course, Hayley Atwell as Agent Carter is unmissable and one of the few MCU love interests who’s actually interesting, but even that isn't enough to place the first Captain America movie higher on this list. While it's definitely got some great moments and it kick starts a cinematic journey for Cap which is well worth sticking with, it's just not memorable enough to stand out from the exceptional MCU movies which came after it. Along with The Dark World and The First Avenger at the not-so-great end of the best Marvel movie spectrum, sits the first Thor movie. For pretty much the same reasons its sequel does... While Chris Hemsworth does a great job of playing the ridiculously good-looking god-like hero, the character is tricky to make work with his old time-y speech and pantomime-like clothes. Thor does set up the character well for his future appearances in the MCU though, as well as establishing his family relationships, which become important later on. In fact, Tom Hiddleston's Loki is one of the highlights of the film and makes his older brother much more interesting, which is probably why Loki has appeared alongside Thor in pretty much ever Marvel movie he's in. The fish out of water scenario Thor finds himself in leads to some genuinely laugh out loud moments, and while it suffers from the same difficulties as Thor 2, the first Thor movie has more heart than it's sequel. Funny, sweet, and with plenty of ridiculous action sequences, Thor is fun. That's just all it is. Marvel's first foray into the mystical world could have been better. While doing away with the wands and spells to rift off ancient Egyptian finger tutting was an act of genius, it isn't enough to transport Doctor Strange to the top of this list. Benedict Cumberbatch's Stephen Strange is Tony Stark with none of the charm to make up for it and that accent... this film alone could have been saved by making the character, like the actor playing him, English. Doctor Strange is a classic origins tale, but that’s all it really is, and while at times it looks amazing thanks to it's Inception-style antics, it lacks the action and interest of other MCU movies. It may have an all-star cast, but many of them are given little to do (hello Rachel McAdams!) and the final fight, while definitely unique, is more than a little disappointing. Doctor Strange is obviously just meant to introduce the character and set him up for future appearances in the MCU and it does just that - it’s good, just not that good. It's the curse of sequels to hardly ever live up to their predecessors (these movie sequels which are actually better than the originals are the exceptions), but make no mistake, that doesn't necessarily mean they're bad. That's the case with Iron Man 2. It's not as fresh and great as the first movie and it's certainly the worst of all the Iron Man films after the third movie knocked it out of the park (more on that later), but it's a very acceptable sequel. And it has Mickey Rourke wielding electric whips! What's bad about that?! This is where we see Stark's fall from grace, and his personal demons with regards to his love life and alcohol really come into play. Plus, we have the introduction of War Machine, and although Rhodey is recast for Iron Man 2, his relationship with Stark is a big part of the movie and the continuation of a bond, which will be important throughout the MCU. The main conflict storyline is pretty forgettable, but everything around it is anything but and it's still one of the most human stories in the MCU today. And talking of sequels which don't live up to the original... It seems like no-one likes Avengers: Age of Ultron all that much - maybe you even think this should be last on this list - but is that because it's a bad movie or just because you've seen it all before? Much like GOTG2, pulling off another Avengers crossover movie didn’t have the same effect the second time around, and it wasn't helped by yet another very generic villain in the form of Ultron. That said, there's lots to love about this movie if you're willing to look at it with fresh eyes. That opening sequence ("Language!")? Hawkeye's secret backstory? The new Avengers? Black Widow and the Hulk's budding romance? That action-packed and emotional finale? All great. Ok, the villain is only mildly threatening and the Maximoff twin’s accents are... interesting, but by everyone else’s standards Age of Ultron is a great movie. It’s just pretty middling for Marvel, which really says a lot about the overall quality of the MCU. It's really hard to look back on The Incredible Hulk with fondness. Mainly because it stars Edward Norton in the title role who ended up being recast for all future appereance of the Hulk in the MCU. And while he's good as the troubled, perpetually tense, pre-acceptance Banner, we all love Mark Ruffalo now, right? But The Incredible Hulk is actually a pretty solid (sort of) origins movie. It skips Banner's 'accident' entirely - instead letting the well-known story play out as part of the opening credits sequence - and picks up with him month later in hiding trying to find a cure. It’s reasonably fun and hits all the key points for a successful superhero movie, but it still suffers from an uninspiring love interest and forgettable baddie. The Hulk himself is a suitably dynamic wrecking ball of a presence – though certainly missing the gleeful fun of the Avengers version – but the film overall lacks the spark and the snap of the later Marvel films. Good but not Marvel good. Oh look another sequel! Guardians of the Galaxy Vol. 2 is a hell of a good time. It takes the formula laid out by the original, straps boosters to it, cranks up the stereo to full, and thrills for over two hours. There are bigger stars, a grander narrative featuring Star-Lord’s actual dad, and huge set-pieces. Even the Stan Lee cameo is beefier. So why isn’t it higher on this list? The original Guardians of the Galaxy was a surprise hit - a Marvel movie so different and refreshing that it set the bar impossibly high for the sequel. Sadly, the second time around the jokes aren't quiet as fresh, you feel like you've seen the new worlds before, and the individual character arcs feel repetitive. While it isn’t as good as the original, Guardians 2 is still a cracking movie, but you can't just churn out a repeat of the first film and expect it to work. Even when that first film is as good as Guardians. While we're certainly out of 'bad MCU movie' territory with Vol. 2, it's not winning any prizes for the best Marvel movie of all time. The very first Marvel movie to give a female superhero double billing in the title, Ant-Man sequel, Ant-Man and the Wasp, marks a significant moment in MCU history, but it's so much more than that too. Picking up after the events of Captain America: Civil War and set alongside Avengers: Infinity War (but released after it), Ant-Man and the Wasp is the perfect palate cleanser to an intense year for the MCU. Like it's original, its simple and effective storyline allows the characters to shine and it's very much about Scott and Hope's partnership, ensuring that that all important double billing is justified. Focusing on familial relationships in more ways than one, it's full of heart and emotion, while still being intensely funny (although not as hilarious as the first film), and while it's not concerned with everything else going on in the MCU, it still manages to tease some incredible possibilities for the future. So why is it only number 13 on our list of the best Marvel movies ever? For all its positives, Ant-Man and the Wasp just isn't as good as its original and while it's definitely one of the best Marvel movies around, there are so many more incredible MCU films still to come. You should definitely still watch it though. 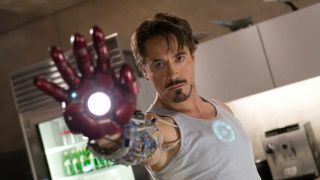 The MCU upped the ante with Iron Man 3, which is far from a typical Marvel movie. In fact, it’s the film that made it very clear that, from 2013 onwards, there was no longer going to be any such thing as a 'typical Marvel movie'. Bringing in Lethal Weapon writer Shane Black to write and direct, Iron Man 3 is part superhero movie, part existential angst-comedy. Black’s involvement is far more significant than his ‘80s action track-record, as his barnstormingly clever, postmodern film noir comedy, Kiss Kiss Bang Bang, was fundamental in relaunching Robert Downey Jr’s career, post-rehab. As such, Iron-Man 3 is a perfect collaboration to round off the character’s initial trilogy, a beautifully written, insightful piece of character-driven, ‘proper’ filmmaking that just happens to have a bunch of flying robot suits thrown in for good measure. With a script tailored to his deeper talents, RDJ really earns his (huge) paycheck here with some fantastic character development for the hero. Why is it still so low on our list then? There's just so many more really, really good Marvel movies to come!